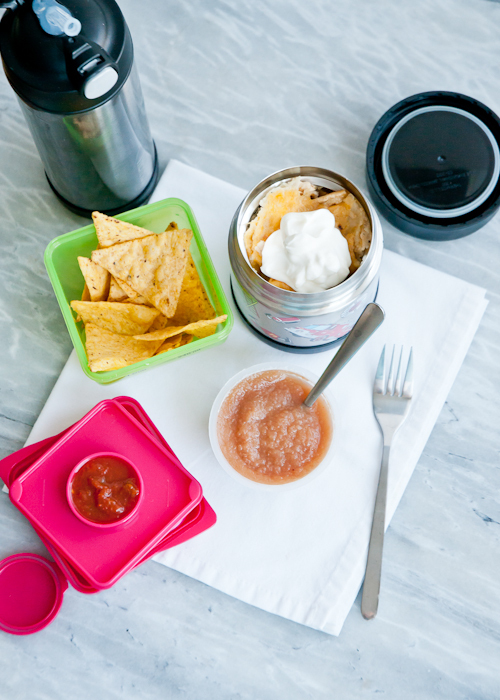 Menu #20 of our Lunch Box Series is all about the leftovers. I’m a big fan of sending them to school for lunch with my kids. Chicken enchiladas is a favorite. Here I’ve added some tortillas chips and salsa and cinnamon applesauce. It’s a very filling hot lunch that I know will always be eaten and enjoyed. And I love the bonus that my leftovers are getting used up! – Preheat the insulated bowl by pouring boiling water inside, draining it and adding the hot food. – Topping the enchiladas with sour cream eliminates the need for another container. Just sent my daughter out the door with one of our favorite leftover lunches. “Taco Mess” or “Taco Parfait”. Taco meat from the night before layered in a thermos with cheese and sour cream. I like the new name parfait. :) It used to be taco mess because she would mix it all up. We send it with some chips and she has a nice warm, protein-filled lunch. That sounds so yummy, Pamela! Thanks for sharing!